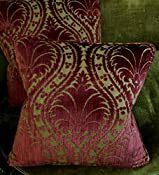 Matching pair of pillows from an incredible cut velvet by Clarence House called Velluto Tibaldi. 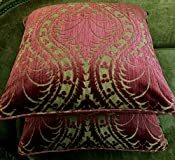 Each cushion measures 20"h x 20"w, a nice, versatile large size. The listed price is for one pair of pillows. 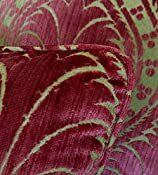 Made to look like an ancient cut velvet, Velluto Tibaldi features a classic palm medallion pattern inspired by renaissance design in a rich, raspberry red on a warm, camel tan ground. Cuttings recommended! 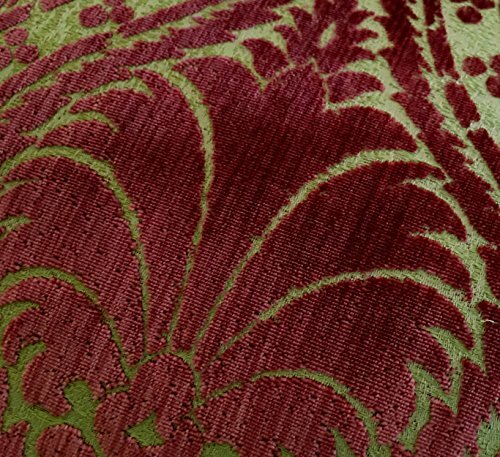 Fabric is a cotton/cupro blend, made to look like silk velvet, but without the fragility. 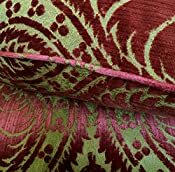 Backed with the same fabric as in the fronts for added luxury, and trimmed with a self welt. Pillows are filled with a lightweight down blend insert, and all materials are new and from a smoke-free environment. Flat rate shipping charge of 9.99 for first purchase, any additional purchases ship for free (in the same order). Just use the shopping cart to add your items, then pay one time for the total purchase. Shipping will be by USPS Parcel Select. Shipping to US only. We usually ship within a day or 2 of receiving payment. Any questions gladly answered.